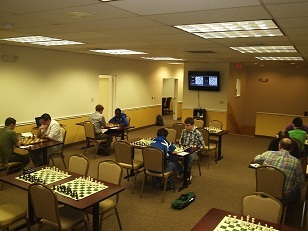 Ten players competed in this Friday’s action quads. Four masters, all rated over 2300, made our top quad one of the strongest to date. Newly crowned NY High School Champion NM Joshua Colas made it look easy and won the section. Colas only gave up one draw to FM Leif Pressman. Josh’s father also performed well in tonight’s swiss section. Guy Colas tied for first with Nowell Sheinwald after both players won their first two games and drew their final round encounter. It was a fun night with lots of dramatic moments. Be sure to join us next week or watch the top games live on our website!